We were told by a local Singaporean that when they have free time, where to go for food comes first in planning where to go that day. “After deciding on the food, then our activities fall into place based on that place,” confirmed our friend Kelvin Chia, a local university student. Eventually, after a few days of traveling around this small South-East Asian island country, we began to plan our days around food too. The local no-frills food courts offer the full taste of local cuisine that won’t hurt your budget. This is where you can try Chinese, Malay, Indian, and the local Singaporean fusion dishes (laksa, chilli crab, rojak, roti prata, frog porridge). There is usually even a ‘Western food’ stall in each food court. After visiting over many trips, we agree there are just two seasons in Singapore – hot, and not quite as hot. Which is why when you walk around Singapore, the desert shops are almost a daily must. Stop in them or eat a lot of eat fresh fruit to stay hydrated. Fortunately, there are refreshing cold (and hot) dessert stalls spaced conveniently throughout the island. We especially enjoyed the S&S Dessert stall, in the Seah Im Food Centre. Joan, the owner, rescued us from dehydration by making us a soursop ice and jelly (even topped with four fresh-squeezed small oranges), and a Red Ruby (small chestnut pieces with a red tapioca covering, ice and coconut milk). After two of these desserts we were just getting started. We ordered a chendol (a coconut milk, ice, green jelly, and coconut sugar) topped with fresh mango and durian sauce, and also a peanut Ice Kacang (an icy dessert with a rainbow of flavorings including red bean, cream corn, and even chocolate sauce). Joan said she makes the tapioca balls and Mango sauces always fresh, so they won’t sit around getting too soft. One of our favorite hawker stalls included Avacado Jr. (Golden Mile Food Centre), whose owner Xiao Ping, made some one of the most freshest and unique drink concoctions we have ever tried (about S$2.50 each). We most enjoyed the avocado milk shake (topped with chocolate syrup), sweet-corn milk shake, durian milk shake (not for everyone), and even our favorite — the Sweet Potato Delight (fantastic!). Singapore, surprisingly, provides loads of free fun, such as free music at Esplanade Park each weekend, and low-cost food at hawker centres in every mall and neighborhood, so then we thought why not the occasional splurge? Todai Restaurant, a large, popular international buffet chain from Korea, at Marina Bay Sands, was where we really spoiled ourselves silly. And why not, with all-you-can eat seafood (including the freshest oysters), and the best Gorgonzola cheese pizza (with apple, blue chees, and honey) we’ve had. We tried several famous Korean delicacies, including salted oysters, salted fish eggs, and seaweed soup. The Koreans at the buffet counter were impressed that we would eat the salted oysters, but we couldn’t resist. Since this restaurant opened in March 2011, it’s making a big name for itself with the locals. “I’ve eaten here so many times, it’s great,” Korean Brandon Chu told us. After enjoying much more of Todai’s food than we should have, we rolled out of the restaurant to see amazing Wonder-Full, the beautiful light and water show (free for everyone). Of course we went on the Singapore Flyer (largest observation wheel in the world), and to the famous first and only Night Safari and to the Singapore Zoo, as well as to the Jurong Bird Park (all three not to be missed). We also visited Sentosa (a popular island beach with an array of activities), rode the quirky Duck Tour, and used the Singapore Sightseeing Pass, which covers fees for many additional tours and attractions. Performing arts complex, featuring music, dance, and theatre. Friday, Saturday, and Sunday nights offer free music on the outside stage, facing the bay. Magician Kien does tricks at your table for free on Tuesday and Wednesday 7pm to 8pm. Monday & Wednesday seniors receive a 20% discount. Like them on Facebook for a free glass of wine. Don’t miss the world famous Night Safari, the Singapore Zoo and Jurong Bird Park. Private lunch buffet with the parrots at the Bird Park, and breakfast buffet with orangutans is available at the Singapore Zoo, but you’ll need to reserve ahead. See the park websites for feeding times for the animals. Our best memory was when we bought food to give to the birds in Loring Loft, and having the birds still look for more food from us by nibbling on our ears. The price is right here, with free-flow coconut rice, and the richest Malay curries you’ll find. Stop here on the way to/from the Singapore Zoo or Night Safari. The largest Ferris wheel in the world. Definitely worth a ride for the view. These quirky narrated tours will get you up to speed on the history and sights of the Lion City. The most creative milk shakes we’ve ever seen, with a smiling and friendly owner; juices and shakes are S$2-$4. Eat these refreshing desserts before going to/from Sentosa. The owner Joan, who took over the stall from her mother 9 years ago, enjoys making new desserts with the ingredients; so if you feel like combining things into something new, just let her know what you like. Cold desserts range in price from S$1.70 and up. Possibly the most famous Rojak (S$3 for a spicy fruit salad) stall in all of Singapore, and one not to miss. You may need to wait one hour for your order, so place it quickly when you arrive. The elderly Chinese couple who makes the food give big smiles when you like their food. Open at dinner-time. Tuesday at 9pm, this open mic comedy is packed wall to wall, with local’s laughter. Here you can get an insight into the comedy of the country’s ethnic diversity, namely the Indians, Malays, and Chinese. You know it well, nicely written! The best travel articles are produced by writers who spend enough time in one place to truly get the flavor of it. Jason and Carla Rupp had a lengthy and enjoyable sojourn in Singapore and plenty of time to sample a wide variety of culinary fare. That is reflected in their informative and entertaining article about a destination most travel journalists just dream of visiting. Thanks, guys, for opening the eyes of many armchair travelers — for doing it so well. We didn’t get a chance to put in how fantastic the Ritz-Carlton Millenia Singapore’s lunch buffet is at the Greenhouse, which was running a 2 for 1 special on Mondays and Tuesdays, because we ate here after writing the article. Check their web site for the latest promotions. The ice cream certainly even beat the taste of Haagen Daz — which is expensive in Singapore (about US$13 for a pint). The cranberry sorbet and soursop sorbet was my favorite here. Every part of this buffet was of the highest quality — from the incredible sushi to the homemade ice cream. 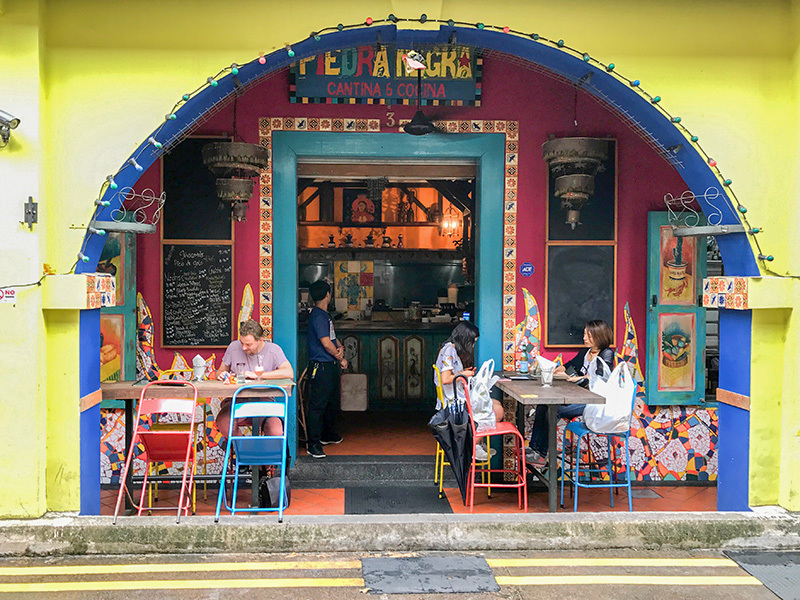 Also — a must for foodie travelers coming to Singapore is to take a day (or even 2 days) to Johor Bahru, Malaysia — which is directly over the bridge from Singapore. It is an easy day trip. Food is about half the cost here. Clothing is cheaper. And you’ll get another another passport stamp to say you have been to Malaysia. The story is coming on that trip. Great to hear about tasty, affordable and homespun food courts in Singapore. Always wondered what a durian tastes like—since it looks like a gladiator’s mace. Fun article from experienced travelers. Appreciate learning about this website, for us older-but-not-ready-for-the-rocking chair travelers.